Links to this page can be found in Book 3, Day 2, View B8 and Rione Monti. At Vasi's time this large circular building was thought to be a temple to Hercules built by Decimus Junius Brutus, a Roman general who in 137 BC conquered the Spanish region known today as Galicia. The Roman Senate granted him the title of Callaicus. The building was also known as Tempio di Minerva Medica after a statue which was found there at the beginning of the XVIIth century (but today art historians believe it was found elsewhere, perhaps at Campo dei Fiori): it portrayed the goddess with a snake, a symbol of Medicine. It is known as Athena Giustiniani because it was part of the Giustiniani collection. 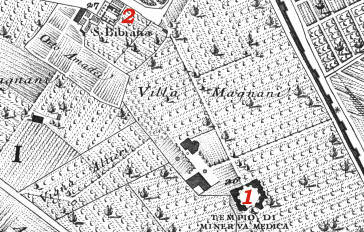 The small 1748 map here below shows 1) Tempio di Minerva Medica; 2) S. Bibiana. 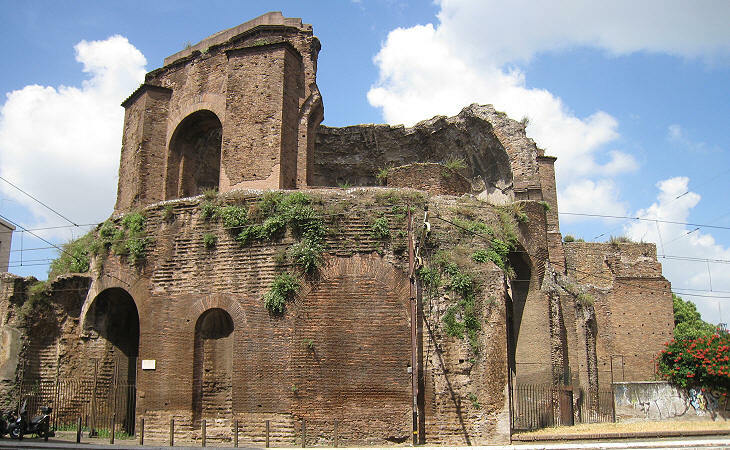 The ruins are now imprisoned between a tramway leading to Porta Maggiore and the rail track leading to Stazione Termini and yet they still call for admiration. The vault partially collapsed in 1828. The building was not a temple, but a IVth century AD nymphaeum, a monumental fountain. 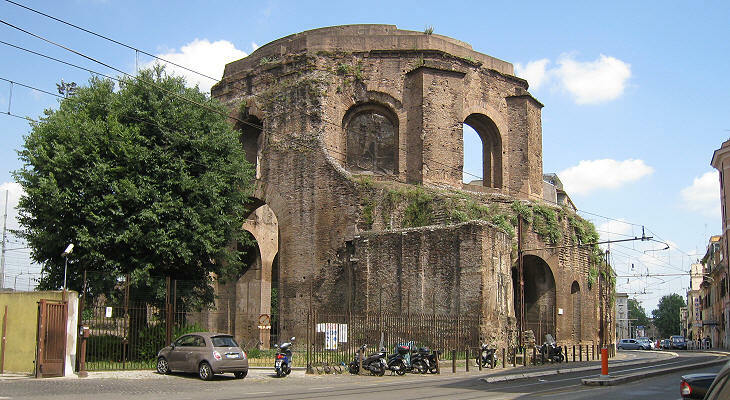 The drum has the shape of a decagon and it supports a concrete dome having a diameter of 25m/82ft, the largest one of ancient Rome after those of the Pantheon and of a hall of Terme di Caracalla. 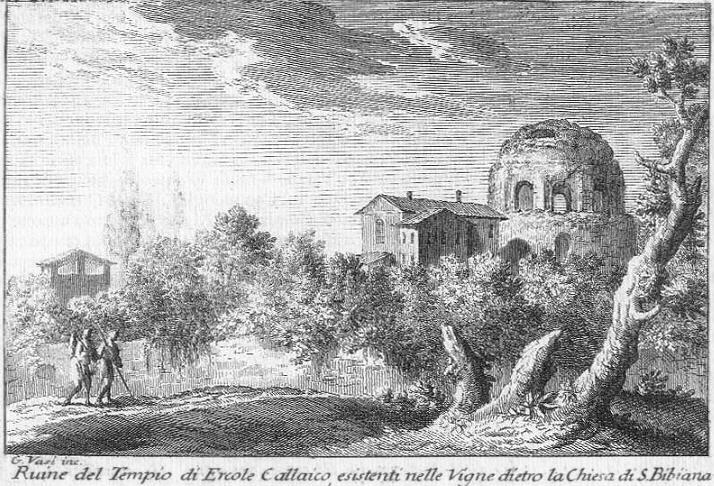 The image used as background for this page shows arches supporting the dome. The nymphaeum stands on the area of Horti Liciniani, a large villa belonging to the Licini, the family of Emperor Licinius Gallienus (260-68). Whenever he (Gallienus) went to the gardens named after him, all the staff of the Palace followed him. And there went with him, too, the prefects and the chiefs of all the staffs, and they were invited to his banquets and bathed in the pools along with the prince. Women, too, were often sent in, beautiful girls with the emperor, but with the others ugly old hags. Historia Augusta - Volume III - translation by David Magie - Loeb Classical Library. 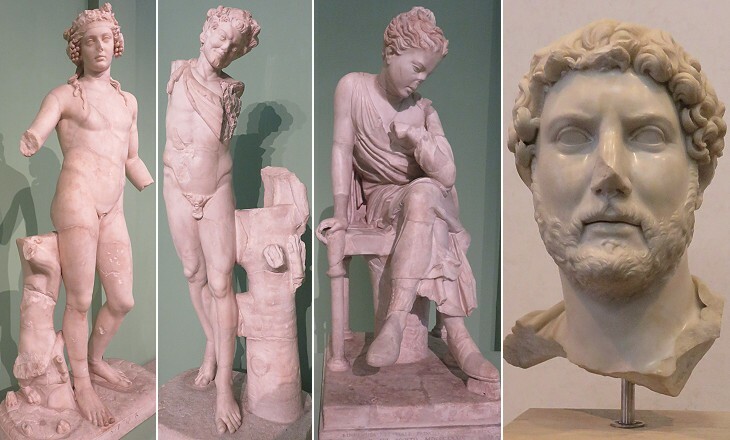 The statues found inside the nymphaeum were made at the time of Emperor Hadrian, more than a century before Gallienus rose to power and almost two centuries before the construction of the nymphaeum itself. They perhaps belonged to a previous wealthy owner of the gardens. 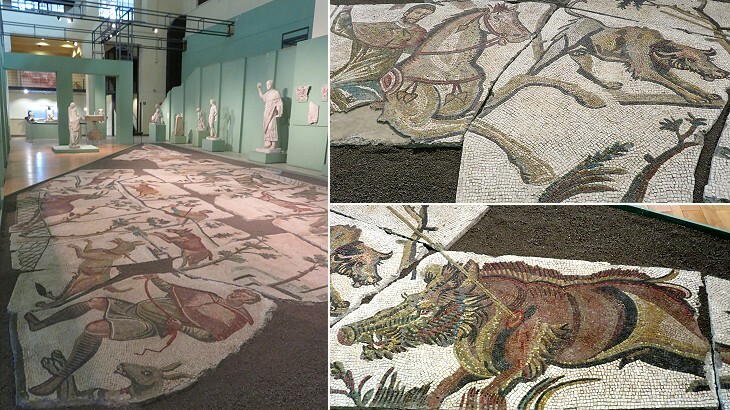 A large mosaic was found in 1904 in the proximity of the nymphaeum. It is the same age as the building and it indicates that Horti Liciniani continued to belong to a very wealthy family after the son and the relatives of Gallienus were all killed in 268. The style of the mosaic departs from traditional patterns as it lacks an elaborate frame and the figures are depicted against a white background. The hunters all wear heavy clothes which is another remarkable deviation from tradition. 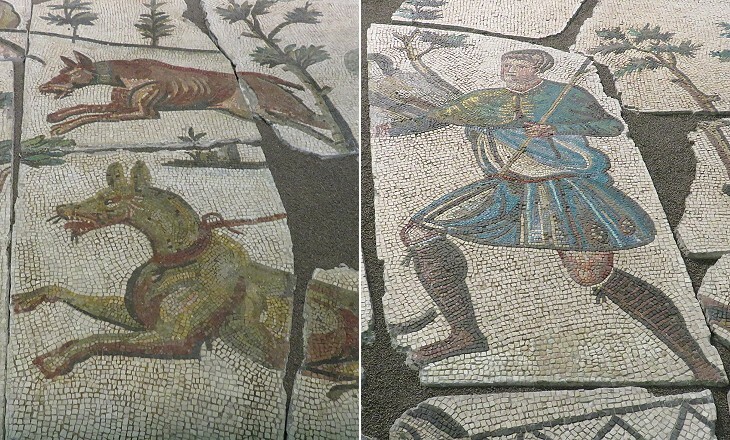 Some details recall scenes of a large mosaic of the palace of Emperor Justinian at Constantinople. Next plate in Book 3: SS. Pietro e Marcellino. Next step in Day 2 itinerary: Trofei di Mario (Sant'Eusebio). Next step in your tour of Rione Monti: Chiesa di S. Prassede. E' questo di figura rotonda fatto di mattoni, rovinato solamente verso levante: alcuni però lo credono di Ercole Callaico eretto da Giunio Bruto per aver soggiogato i Callaici popoli della Spagna.